A letter of Government of the Punjab finance department Lahore has issued on 11th October 2018 regarding Elementary School Teacher Salary Deduction 2018 Finance Department Punjab. 1. The Secretary, Govt. 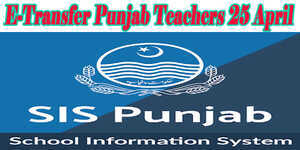 of the Punjab, School Education Dept. 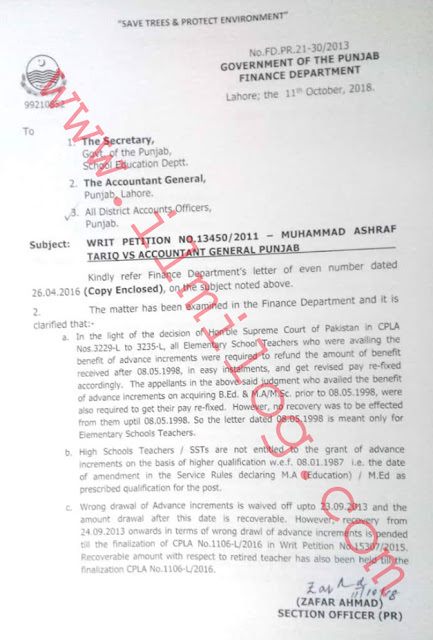 2 the Accountant General, Punjab, Lahore 3 All-District Accounts Officers, Punjab. Kindly refer Finance Department's letter of even number dated 26.04.2016 (Copy Enclosed), on the subject noted above. a: In the light of the decision of Honorable Supreme Court of Pakistan in CPLA Nos.32294 to 32354., all elementary School Teachers who were availing the benefit of advance increments were required to refund the amount of benefit received after 08.05.1998 in easy installments and get revised pay re-fixed accordingly. The appellants in the above said judgment who availed the benefit of advance increments on acquiring B.Ed. & M.A/M.Sc. prior to 08.05 1998 were also required to get their pay re-fixed. However, no recovery was to be effected from them up to 08.05.1998. So the letter dated 08.05.1998 is meant only for Elementary Schools Teachers. b. High Schools Teachers I SSTs are not entitled to the grant of advance increments on the basis of higher qualification w.e.f 08.01.1987 i.e. the date of the amendment in the Service Rules declaring M.A (Education) / M.Ed. as a prescribed qualification for the post. c. The wrong drawl of Advance increments is waived off up to 23.09.2013 and the amount drawl after this date is recoverable. However, recovery from 24.09.2013 onwards in terms of the wrong drawl of advance increments is pended till the finalization of CPLA No.1106-L/2016 in Writ petition No.15307/2015 Recoverable amount with respect to retired teacher has also been held till the finalization of CPLA No.1106-L/2016.